I know the story of LITTLE SHOP OF HORRORS, but have never seen any version of it. I did not know that this 1960 Roger Corman film was the original telling of the story, and that the musicals and film remakes were all based on this film in particular. How does it hold up 54 years later? I watched THE LITTLE SHOP OF HORRORS (1960) on 5.22.14. It was my first viewing of the film. What an odd, odd, odd film is THE LITTLE SHOP OF HORRORS! This is a movie which fires silly jokes at you like a bad high school play, gives you an endearing nerdy underdog to root for as he unconsciously woos a girl and kills people to feed his plant, and features a stereotypical Jewish shop owner who constantly uses the wrong words when speaking. The first ten minutes of this are a shock to the system. You almost have to absorb enough jokes to become numb to the terrible ones. It is hard to tell if the jokes get better as the film goes on, or if the bad ones get easier to ignore (there is a running gag involving a cop who’s son died the previous day playing with matches. The cop is indifferent, repeating the line “Them’s the breaks”). Regardless, this is a movie which gets better with every passing minute. A nerdy and bumbling whippersnapper, Seymour (Jonathan Haze) makes $10 a week working for the paranoid and greedy flower shop owner Gravis Mushnick (Mel Welles). Seymour screws up a flower order and is fired. Another employee Audrey (Jackie Joseph) pleads with Mushnick to keep Seymour. Seymour says he has a brand new plant he is growing which will be a star attraction. Mushnick gives him a week to prove it. 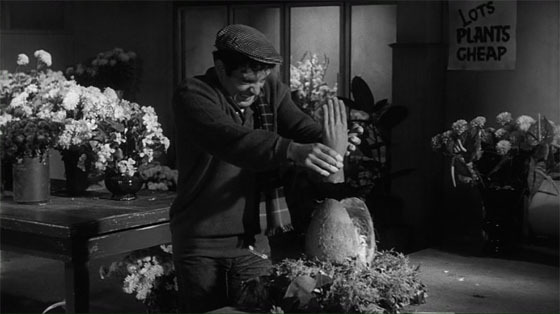 The plant, whom Seymour has endearingly named Audrey Jr., is a blood thirsty piece of vegetation. It grows and grows and the body count rises as this movie spirals towards an inevitable conclusion. The movie really starts to take off when the plant, surprisingly, starts to talk to Seymour. Before that it was hard to tell what kind of film we were in. There was a police voice over to start the film like this was a noir. Then we had some bad jokes. Then we had Seymour pricking his fingers masochistically to feed his plant. Then the plant starts talking and everything becomes clear. “Oh,” we say to ourselves, “this is a world in which murder is a whoops, plants talk, and the jokes don’t really matter.” Once that realization is made, everything makes perfect sense and great fun will be had. This was a film which later became marketed as a Jack Nicholson. 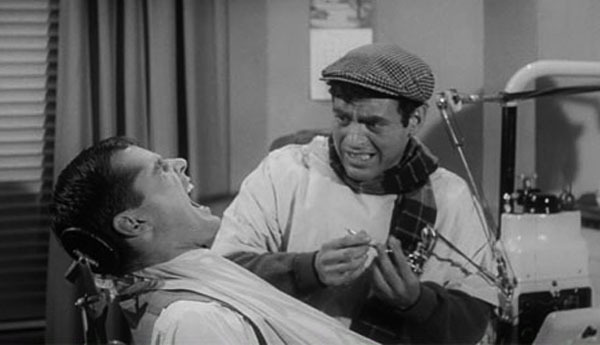 And while he is only in one scene, there is, indeed, a 23 year old Nicholson playing a guy who visits a recently murdered dentist because he enjoys the pain of the drill. It’s another odd scene in an odd movie, but you can see why this tangent is kept in because Nicholson is fascinating to watch in this minor role. There are some unintentional shooting gaffs in this film. A train scene jumps the 180 degree editing line constantly. Positioning in establishing shots might not match positioning in close ups. But, on the other hand, Roger Corman nails a whole bunch of bits. The first hand fed to the plant must have been shocking in 1960, both for its bloodiness and its intention as a humorous moment. In 204 this is tame, in 1960 this stuff wasn’t being released in theaters. The music is dissonant and surprisingly effective. All of this film was shot in two days, so there must have been plenty of fixing to do in the editing room. Adding a great score is a wonderful way to spruce up a film like this. This is an amazingly watchable movie, even a half century later. This is one found unexpectedly which would be a joy to share with others who have not been exposed. Perhaps not a classic in the sense of the great filmmakers, there is no denying that Corman does an expert job of entertaining and telling a weird freakin’ story. The music in this movie is wonderful. It might be ironic, scary, or atmospheric at different times. Whatever it seeks, it succeeds. ~ by johnlink00 on May 24, 2014.